This weeks game was a colonial skirmish. The Scenario involved a district commissioner, with a scratch force of contingents, being dropped off by steamer near the princedom of N'putku, which had failed to pay its taxes this year. Unknown to him though, the prince had gathered a small force of warriors and intended to drive the foreign devils back into the river! The Imperial force consisted of some Askaris, armed with percussion muzzle loading rifles, and some police, unused to warfare, armed with smoothbore muskets. A quickly assembled barricade made from the expeditions supplies. The open terrain of East Africa. A group of Colonial police deployed in skirmish order to await the enemy. Some more police manned the barricade, with the askaris to their right. A small group of archers appeared, shooting ineffectively. The princes guards deployed opposite the police. ..with some lesser warriors on their left. A swarm of musket and bow armed warriors deplyed in front of the askaris. ..with a body of warriors moving to attack the askaris flank. The Guard troops advanced with the other warriors supporting. The native skirmishers advanced shooting at the askaris. Seeing the mass of warriors approaching, the police commandant led half his men towards a small knoll on the left flank. The askaris, seeing the main force moving on the police, moved to face them by filling the gap in the line left by the police redeployment, the police in the redoubt covering the move . The skirmishers seeing the askaris move, advanced aggressively, shooting. Even at this long range, they luckily killed 2 askaris! The redoubt police moved back and fired at the skirmishers as they got line of sight. The police reached the knoll, but some of them, harassed by the archers, broke ranks to fire back. The main body of skirmishers continued to press the askaris. ..who turned and fired, but not at the skirmishers. A few native warriors fell but continued advancing. The police on the knoll rushed out to maul the archers before the guards reached their position. ..then bemused the remaining archers by falling back to the knoll! The archers made good their escape, but the guardsmen advanced through a hail of lead towards the police on the knoll, who were loading fiercely to receive them. Fortunately for the police, half the askaris were shooting at the guards! The police in the redoubt were left to deal with the massed skirmishers. Back on the left, the white head dressed guards retreated, allowing the other unit to continue the attack on the knoll. The police, having helped stop the 'White' guards, loaded rapidly before the 'Red' guards attacked. Meanwhile, the redoubt police continued to hit the skirmishers..
..ignoring the massed warriors attacking their flank. The police, finally, seeing the warriors about to charge, reloaded quickly to get a shot at them. Back on the far side, the 'White' guards reformed, to support their brother warriors. ..who closed with the police, who held their fire till the last moment. The devastating short range volley scattered the natives, who fled. The askaris meanwhile, were busy shooting up a band of warriors attacking them! The redoubt was assaulted as the ragged police volley failed to stop the attack. ..and gradually beat back the natives, though not without loss. The native guards decided not to renew their attack. Now supported by some askaris, the redoubt defenders routed their attackers. The natives now all began to retreat, as the askaris now advanced, the day was won! The battle was quite close, both police units, being raw, were lucky to win, and the askaris, despite taking some casualties, were able to hold their own position, and aided the police on the flanks. The natives took about 30% casualties, but escaped largely intact, so probably would have agreed to pay their taxes...until another opportunity to revolt presented itself! As the title suggests, after 15 years in a box, I finally got all my Eureka miniatures Jaffa and Ground Zero Games SG teams out to game with! The rules I had written for this were the precursor to all my subsequent skirmish rules to a greater or lesser extent! A week ago, SG6 was chased back through the Stargate by a large force of Horus guard Jaffa. The reconnaissance mission they were on was to investigate unusual energy readings a MALP had recorded in a ruin on P3X504. The view of the gate from the drone. The 'Sacred grove' and the crossroads. The ruined fort on the hill, still emitting low level radiation. Banking right, the drone approaches a temple. Then over some woods to the Stargate, no enemy sighted. A few minutes later, the Stargate reactivates. SG1 are the first through the gate. ..followed by SG2, 3 and 4. Having scouted ahead, O'Neill halts and calls the other teams forward. SGs 3 and 4 are directed through the woods to check the 'Temple area'. SG1 moves up the road to the ruin, but hear a familiar sound, marching Jaffa, obviously alerted by all the Stargate activity. O'Neill signals the other teams to cover. The leading Jaffa trundle on heedless to the danger. SG3 continues on to the 'temple' while SG4 moves into ambush position. O'Neill moves SG1 round the wood to flank the Jaffa, Teal'c spots the Jaffa columns rear and retreats to cover till they have passed by. SG3 approach the temple, but see nothing. SG2 take a position on a hill overlooking the Jaffa column. The Jaffa still see nothing! Seeing the perfect position, the SG teams open fire. The Jaffa are stunned, as several fall. The first group fall back to the woods. Other Jaffa approach and fire at SG2, but suddenly some Jaffa at the columns rear are hit! O'Neill and Teal'c each take one down, some of the Jaffa panic and run. A lucky staff blast kills one of SG2 on the hill. The Jaffa desperately attempt to get their numbers to tell. ..but shot at from all sides they begin to break up. Daniel and Carter join the fight, Teal'c hits another Jaffa. A few of the surviving Jaffa lurk in a wood attempting to shoot back. SG1 races after the rest, their kill tally rising steadily! The Jaffa in the wood finally flee. SG1 mops up the rest. O'Neill gathers SG1 and 4 and starts toward the ruins. Approaching from 2 sides, the 2 teams enter the deserted fort and look around. Daniel notices some writing he recognises, from Ernest's planet..one of the 4 races? SG3, having found nothing in the temple comes to rejoin SG1. The 3 remaining SG2 members check the 'Sacred Grove'. They find nothing. SG2's lookout spots the Stargate opening, and some Serpent guards moving up the road. Suddenly, the first Jaffa group runs forward, they have spotted the dead Horus guards. The main body of Jaffa, led by the 2nd Prime of Bastet, pause to hear their report. SG1, 3 and 4 set up a defence perimeter in and around the ruin. Daniel and Carter continue to investigate the ruin. The Jaffa turn towards the ruins. 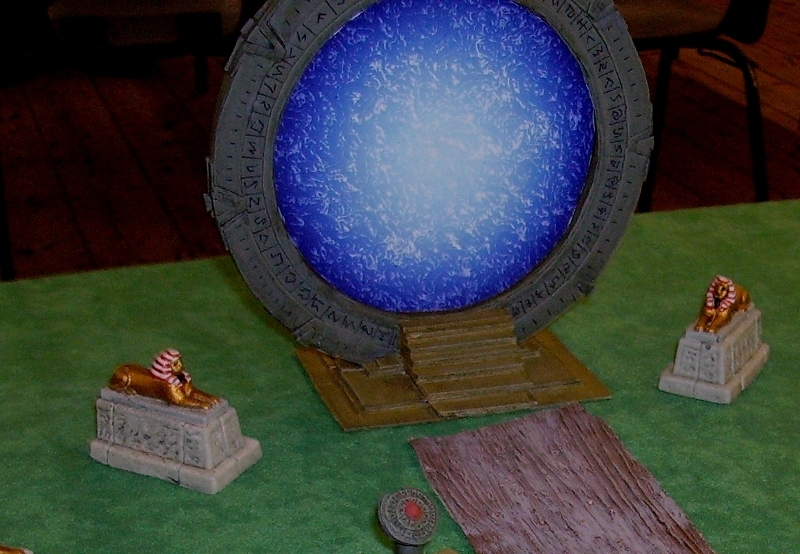 A small group are detached to return to guard the Stargate. SG2, fearing they have been spotted, head for the ruins. A group of Jaffa were indeed on their way to the sacred grove! The Jaffa at the front of the column, came under fire from the ruins, the first group headed for cover and fired back with their staff weapons. Dr Jackson ducked back from a nearby staff blast, but the hits on the masonry created a growing hum within the structure. More Jaffa joined the fight! Suddenly, in a flash, the SG defenders of the ruin were replaced by a group of stunned Jaffa! - the 3 members of SG4 outside the structure looked in and opened fire. The Jaffa outside the structure, confused, advanced to attack the ruin. SG4s attack quickly cleared the ruin of Jaffa. SG2, having made contact with a surprised SG1 at the Stargate, hurried towards them. Carter surmised the ruin had been hit by staff blasts, which charged it up till it teleported the contents to the Stargate, and sent the Stargate defenders to the ruin. O'Neill contacted SG4 and ordered them to defend the ruins till the ruins reactivated. Carter insightfully got everyone out of the circle of lions near the Stargate, where they had appeared! The first Jaffa approached the ruins. The rest followed, urged on by the prime. SG1 moved away from the gate to find SG2. SG4 was having a hard time pushing back repeated Jaffa attacks. Finally SG4 fell back into the ruins, and the attacking Jaffa fired into the structure...the hum rose in pitch until, in a flash, the attacking Jaffa were thrown back and SG4 found themselves at the Stargate! Teal'c had recovered the dead SG2 member, and reunited, the SGC troops headed for the gate before the Jaffa realised what had happened! First through were the marines of SG3. Then followed quickly by SG4..
O'Neill paused to check the Jaffa were nowhere in sight..
..and stepped back into the event horizon. Such was the game! - SG1 was run by the solo system, with me (as gamemaster) giving any verbal interaction as per the scenario rules. The SGC had failed to solve the complete mystery of the ruins, as SG3 had failed to find the remote hand held device used to control the teleport, the ruins were left to discharge and transport to its last programmed destination, the Stargate, when the charge reached dangerous levels. Happy new year..at the coast!